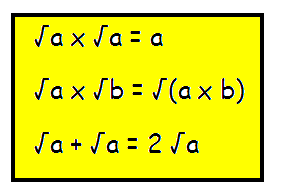 The method of multiplying the radical terms which are added or subtracted inside the bracket by the common radical term or numerical value outside the bracket is know as distributive property. 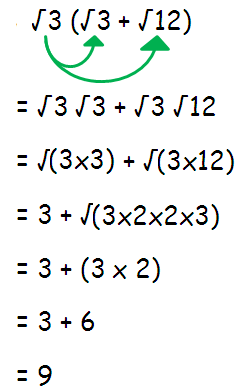 By using the distributive property of radicals, we can show the answer in the simplest form. Hence the answer is 9. Distribute -√2 inside the bracket. For every two same numbers which are multiplying inside the radical sign, we can take one number commonly from the radical. Hence the answer is 4√2 + 2. Distribute √2 inside the bracket. After having gone through the stuff given above, we hope that the students would have understood "Simplify radical expressions using the distributive property". Apart from the stuff "Simplify radical expressions using the distributive property", if you need any other stuff in math, please use our google custom search here.